The owner of a cat which visits a supermarket every day, has had to ask people to stop feeding his pet because he was putting on weight. Eight-year-old Garfield, who makes the trip to Sainsbury's in Ely in Cambridgeshire on a daily basis, has his own Facebook page created by fans. 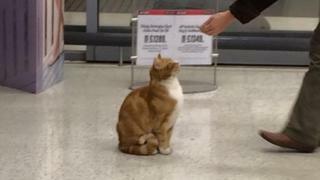 Owner David Willers posted a message asking shoppers to lay off the treats as a vet found Garfield, who weighs 6.6kg (one stone), was overweight. "Everyone loves him," Mr Willers said. "The other day when it was cold and he stayed indoors, a member of Sainsbury's staff messaged me to ask where he was, which was very sweet. "He brings more customers into the shop - people tell me they go and shop there just to see him." Garfield's Facebook page was set up last summer by a couple who had spotted him in the shop, and is now run by Mr Willers. "We worry about him crossing the road, but we don't really get any negative comments about his habits," he said. "We live about a four-minute walk away from Sainsbury's but Garfield knows all the shortcuts so can get there quicker than that."